The Lord Mayor welcomed pupils from Osbaldwick Primary School to the Guildhall this afternoon to congratulate them on finishing runner up in a national design competition. The designs, which are now on display at the side of the Mansion House, saw all the students involved draw their interpretation of the Mansion House, images of the Lord Mayor, civic crest and their school name as work to restore the Mansion House continues. The designs were submitted in the 2016 Ivor Goodsite hoarding competition. 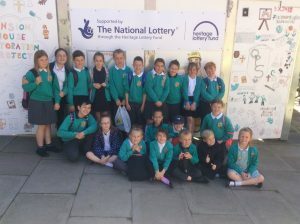 Before designing the hoardings the pupils were taken on an exclusive hard hat tour of the Mansion House of the building for inspiration and to learn more about construction processes and civic history. The Lord Mayor met with the pupils and Charles Anelay from the Mansion House contractors William Anelay Ltd, to congratulate them on their work and present them with a certificate and a medal.